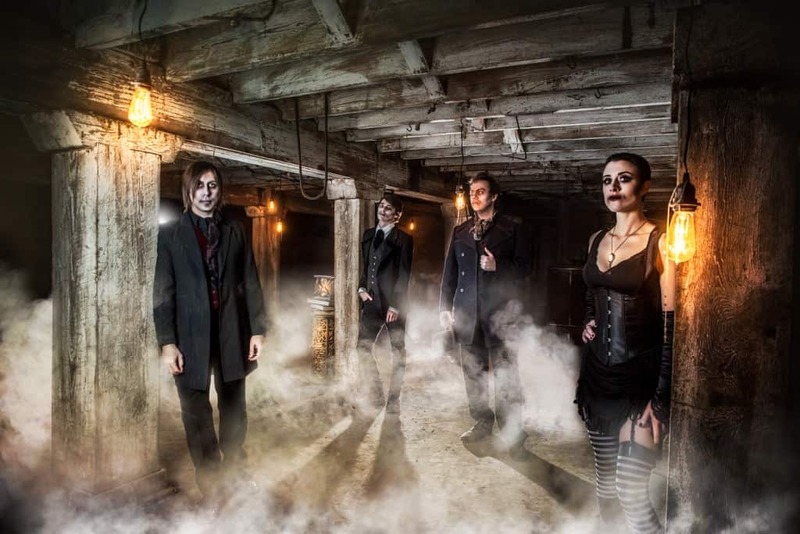 Here’s our latest Reverbnation spotlight on the delightful Marquis Of Vaudeville. Enjoy! Our music is influenced by all sorts of varied sources: dreams, art, literature, film, theatre; typically, indie, cult, fantasy/scifi, classic works, as well as, the cosmos, love, liberty, mythology, mysticism, mystery, & magic. From the musical world, we’d have to say The Cure, Bowie, The Beatles, Pink Floyd, Queen, Radiohead, Alice Cooper, Danny Elfman, Yann Tiersen, Ravi Shankar, Bob Ezrin, music of other cultures from around the globe, 60’s psychedelic, 70’s Glam, 80’s Post Punk & New Wave. A great many of our influences can be dark, yet playful because that’s a bit of who we are. As one would expect, our personal inspirations we draw from the many facets of life; usually dealing with dreams, rebellion, love, loss, hope, understanding, oppression, outcasts, isolation, mental illness, the internal struggle within one’s self, perseverance, self-destruction, death, loneliness, finding & accepting one’s self, sometimes from personal experience, sometimes from another’s perspective. Our songs are quite often wrapped up within, & somewhat veiled behind, an imagined story dealing with some sort of fantastical idea such as discovering other worlds & alternate universes, The Sandman, star-crossed vampires, vengeful magicians, mysterious whimsical circuses, plundering gentleman highwaymen, intriguing labyrinthine understreets, mad scientist toymakers, or the anthropomorphic personification of death. As we said, dark, yet playful. This is a tough one as it’s truly difficult to categorize and define our sound with words. We create music that we want to create, not music that fits into any single definable genre; although it is all very deliberate and focused. We’ve heard descriptors ranging from ‘alt/rock’ to ‘progressive, psychedelic punk cabaret’, to ‘canivalesque rock theatre’. Even each of us within the band had a different response to this. We have songs that fit into two different categories, but as a whole they collectively define our sound. For instance, from our upcoming album: ‘Mystère Sir’, ‘Vaudevillain’, ‘We’re All Mad Here’, and ‘Marionettes’ all have a somewhat playful, old-world, vaudevillian vibe that go together. Then we have ‘Elude the End’, ‘The Dreaming’, and ‘Silence the Serenade’ that capture more of a modern, seriously sleek, emotive, vibe. You put all of these together, and you get what we are. Musically and thematically, these are us. This is we. We’re always so amazed that people so far away have heard of us, and have heard the music and love it. We’ve been told time & time again that our music has a very British sound. That’s probably because a great majority of our musical influences have been British bands. We’re so grateful for any support given to us from anywhere in the world. We hope that our music is able to impact you as much as the UK’s music has impacted us. We’d love nothing more than to tour your side of the pond and perform for you all – be on the lookout for our new album this summer, and like Anonymous, expect us. A sonic and visual assault to the senses. Our all, every time; hearts, hopes, blood, sweat, & tears laid bare before all. We don’t just put on a show; our wish is to transport those in the audience through a portal and into another world; a world where you can leave your troubles at the door and lose yourself in the atmosphere just as much as within the music. We expect to create a certain sense of grandiosity for our attendees so we decorate each venue with props and other adornment for more of an escape from reality. We encourage our patrons to dress as extravagantly and expressively as they will, usually in some sort of Victorian or old-world attire, so our performances invariably become masquerade galas from another time and another place. We’re well known for our extravagant Vaudevillian inspired sold-out spectacles such as ‘A Clockwork Wonderland: Through Aether & Mysterium’, ‘Gadgets & Gobstoppers: The Twisted World of Wonka’, and the show that shared the title of our debut album ‘The Great Promenade of Fools & Ghosts’. After each show, we always make ourselves accessible to meet and speak with every single person who wants a little of our time. We couldn’t be here without them, and we like to make sure that we show our appreciation for them through our interactions as well as our music. Time. Time is probably our biggest rival right now. There is so much that we want to accomplish for our fans. Finding the time to achieve everything we want to do musically, visually, and thematically can be difficult. Between writing/rehearsing/recording new music, promotion, booking requests & performances, as well as the other seemingly limitless tasks involved in progressing a band, it never seems that there is enough time in the day. Although, you’ll be hard pressed to find a more ambitious, dedicated, determined, and diligent group of individuals, alive or dead. Yet, please don’t go digging up graves. That would be messy, and a lot of work to prove a point, ineffectual even, as they won’t do anything at all. Now that we think about it, we should have said grave diggers as our biggest challenge. So grave diggers. S] What’re your plans as we move forward in 2016? There will be more music, more merch, more photos, more videos, more tour dates. We have so many maps, outlines, and blueprints on the drawing board at the moment. As mentioned earlier, we’re currently laying the stonework for our sophomore album which will be riddled with incredible songs. It’s going to be a lovely album. We’re wrapping up pre-production, then going into the studio next week and plan to release it later this year with a date that is to be announced. Our friend, Senyphine, an incredible artist from France who created the cover for our first album, has already been working on the artwork. We’re also currently concocting our second ‘A Clockwork Wonderland’ spectacle that we are planning & producing for a U.S. pop-culture convention called A-Kon in June. A-Kon hosts around 30,000 attendees each year so there is a great deal of preparation involved. If all goes as we hope, then we’ll be heading to the UK in 2017 for some performance dates which is immensely exciting. We are definitely excited. You should be excited. We should all be excited. This portion excited us. Isn’t that exciting?